How can White Flint draw local businesses? Posted on September 30, 2013 by dan reed! Comments Off on How can White Flint draw local businesses? When Federal Realty Investment Trust announced the first six restaurants that will open at Pike + Rose, the mixed-use development at Rockville Pike and Montrose Road, some people were upset they were all chains. Will there be a place for local businesses in the future White Flint? 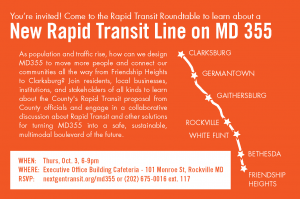 You’re Invited to Learn More About Rapid Transit on MD 355! Comments Off on You’re Invited to Learn More About Rapid Transit on MD 355! 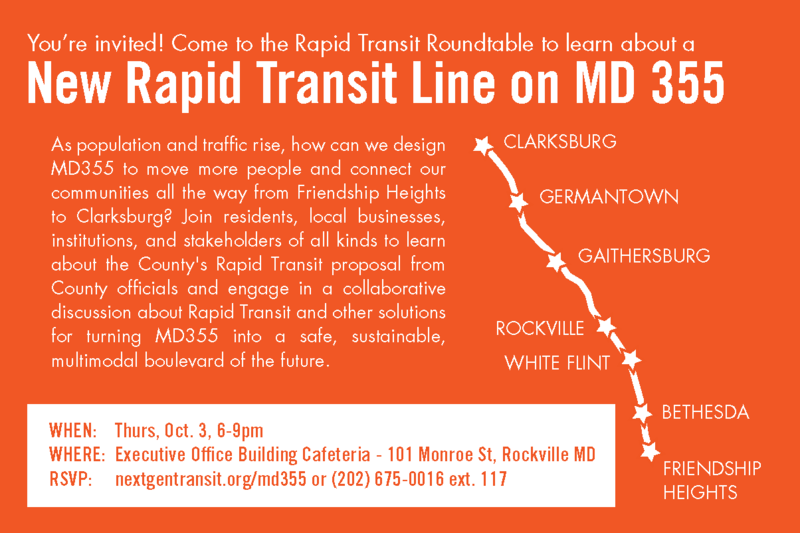 Please join us for a community discussion about the proposed Rapid Transit Network in Montgomery County and, specifically, about the MD 355 Corridor. An educational community discussion about Montgomery County’s proposed Rapid Transit System for stakeholders along the 355 corridor. This week, the Montgomery County Council is holding public hearings on the proposed Bus Rapid Transit Network. We’ve been talking about the potential of this project for months and, now, a study shows that bus rapid transit ignites development better than other transit modes. New “Upcoming Events” sidebar and Calendar page! Comments Off on New “Upcoming Events” sidebar and Calendar page! Can Wall Park become more than a parking lot? Posted on September 20, 2013 by dan reed! Wednesday night, representatives from Montgomery Parks led a community discussion about how to renovate Wall Park. While some residents were concerned about losing parking spaces and impacts to the Kennedy Shriver Aquatic Center, others were excited about the park’s potential. Support Friends of White Flint, Get Paladar Latin Kitchen! Comments Off on Support Friends of White Flint, Get Paladar Latin Kitchen! Now is the time to support the work of Friends of White Flint and get something in return! Better ways to get to school: are we there yet? Comments Off on Better ways to get to school: are we there yet?